South Africa is planning to grant diplomatic immunity to Zimbabwe’s First Lady Grace Mugabe, allowing her to return to Harare and avoid prosecution for the alleged assault of a 20-year-old model, a government source said on Friday. Police have put border posts on “red alert” to prevent Mugabe fleeing and indicated she will receive no special treatment in the case involving Gabriella Engels, who says Mugabe whipped her with an electric extension cable. Engels said she was assaulted by Mugabe on Sunday evening as she waited with two friends in a luxury Johannesburg hotel suite to meet one of Mugabe’s adult sons. A senior government source said there was “no way” Mugabe, 52, would be arrested because of the diplomatic fallout that would ensue from Zimbabwe, which has been led for nearly four decades by 93-year-old President Robert Mugabe. Other countries in southern Africa that supported South Africa’s ruling ANC in the long struggle against apartheid would also see Grace Mugabe’s prosecution as a betrayal, the source said. “There would obviously be implications for our relations with Zimbabwe. Sadly the other countries in the region are watching us and how we are going to act,” the source said, asking not to be named. South Africa’s foreign ministry spokesman declined to comment when contacted by Reuters. South Africa is home to an estimated 3 million Zimbabweans, but it has been powerless to prevent Zimbabwe’s economic and political decline over the last two decades. Engels’ mother Debbie, who released photographs of her daughter with gashes to her head requiring 14 stitches, said it would be “very sad” if Grace Mugabe was allowed to leave. However, her daughter’s legal team – which includes Gerrie Nel, the prosecutor who secured a murder conviction against Olympic and Paralympic track star Oscar Pistorius – would counter such a move, she said. Afriforum, an Afrikaans rights group that Nel joined in January after quitting as a state prosecutor, said it would be illegal for Pretoria to give Mugabe immunity and branded the plans a “disgrace”. “The government has two responsibilities: one, to protect its own citizens and two, to act according to the law. And the granting of diplomatic immunity would transgress the law,” chief executive Kallie Kriel said. Robert Mugabe arrived two days early in Pretoria for a regional southern African summit this week to help resolve his wife’s legal problems, the source said. 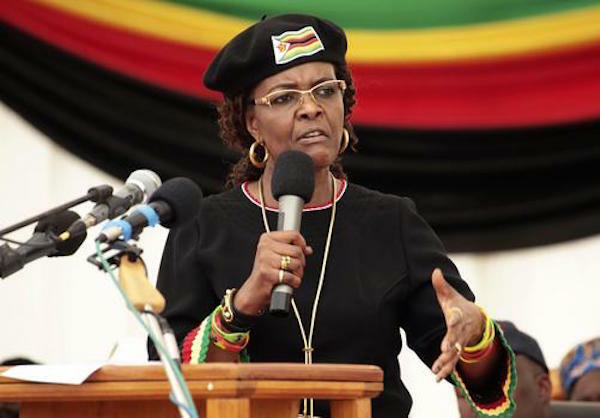 The Engels incident is not the first time Grace Mugabe – who is lauded in official Zimbabwean media as ‘Mother of the Nation’ – has been in legal hot water.